So this week I’ve been late and lazy up to this point. That kind of carried on til this morning as a combination of polishing off two bottles of Côtes Du Rhône last night and a messed up phone battery (hence no alarm clock!) left me dozing in til gone 10 o’clock. One of those where I could have happily turned over and snoozed off again! Maybe that’s one of the best compliments I can give the wines from last night. 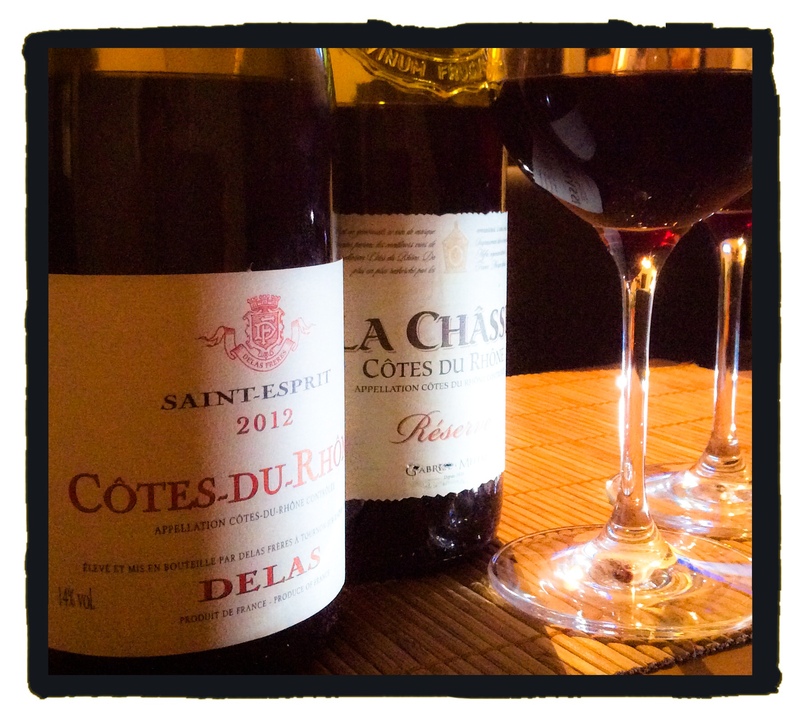 We had Delas’ Saint Esprit 2012 from Majestic Wine and Gabriel Meffre’s La Châsse Réserve from Sainsbury’s. I’m guessing I had just over a bottle’s worth, which is usually a tad more than I’m ok with on a Monday night, but I’ve slept like a baby and woke up hangover-less! That’s definitely a tick in the box for the pair. Now onto the wines. They both had a deep ruby red colour to them, both had that signature peppery taste in the mouth, very similar in terms of body (knocking on full, but not quite there), both had noticeably grainy tannins, and I have to say neither quite had enough acidity to make me want to drink lots of either on their own. Well at least not without a glass of water and some food on stand by! But these were two very differently flavoured wines. The Delas was a bit redder fruit, with raspberries, light plum, and fig flavours, coupled with a smell of herbs. I couldn’t work out whether I wanted to say thyme or rosemary, so I’ll say both. The Meffre was a bit darker, with more brambly and blackcurrant fruit. This has probably quite a bit to do with the use of Cinsault in the blend alongside Mouvedre, Syrah, and Grenache. There was still a touch of herby smell, more kind of bay leaf really. You could tell it had been oaked, but more by the mouth taste, the label reckons there are hints of vanilla but it was too subtle for me to pick up. Best part about it was the heavier, longer, fruitier, and less tart finish compared to the Delas. I enjoyed both, and liked that they were, I guess, classic Côtes Du Rhônes. A very passable 10/20 for the Delas, and a pleasing 12/20 for the Meffre. I’d imagine that’s very true. These ones were young, lots of body, tannin, flavour, but just not quite right yet. Love the 2010 vintage of Delas Esprit. Echo Anatoli above Delas Freres do make good solid wines.